We get lots of demos sent to us at Jazzman, and we listen to them all. Some of them are good and worthy of release, but we can't put out everything we just happen to like. 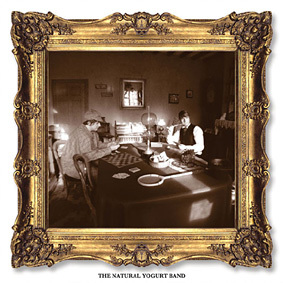 But then every few years something comes along that is so good it gets played in the office over and over and over and over again and captivates so much we just HAVE to release it ... and the Natural Yogurt Band is it. The cd they sent was accompanied by no credentials. There was no promo sheet name-dropping the famous DJs who are playing their music, no pretentious CV stating who plays what and who used to play with whoever; no info, no blurb and no gumph. In other words they just sent me a plain cd, which was refreshing, because at the end of the day all that matters is whether it's any good or not, right? So what is it about their demo that we find so fascinating? Well, for starters you can hear real people imaginatively playing an ingenious assortment of real instruments. Then there are the original ideas, played out as quirky, innocent instrumentals, and their flawless execution lacks pretence and self-consciousness. You also get the feeling that they are having FUN making their music. And it comes naturally, they're not trying too hard. After a while trying I managed to finally speak to one of the chaps behind the NYB, Wayne Fullwood (ex-drummer of Little Barrie), and he explained: "We wanted to make a record that we would enjoy listening to ... a pastiche of different moods that make up an interesting album. We never thought about the commercial elements or about success and didn't even think about releasing it until later ... we weren't sure whether anyone else would like it. It's not a record that's about listening to the coolest musical tastes or name checking all the right people ... it's more about soul and feeling and what we wanted to hear on an album." He went on to mention his tastes and musical infuences - Italian gangster films, weird Polish jazz, leftfield electronics, McDermott, Axelrod and Morricone - all the right stuff, and they've made their own auditory visualisation of what they feel is good. Oddball, leftfield, funky; yet unpretentious and effortless ... now that's what I call good music.